I grew up around collectible card games. My dad played Star Wars CCG, an incredibly complex, infinitely customizable card game from Decipher. It was the greatest game I never played: I was too young to grasp the game during its heyday. By the time I was old enough to play, Decipher had sadly moved on to other concepts (Young Jedi, Lord of the Rings, WARS), but I will always remember standing on my toes at the end of the kitchen table, straining to read and understand the cards my dad and his friends were playing. SWCCG’s main concept, (besides probably confusing its players as much as possible: I’m looking at you Brainiac) was… resource management! Well, that sounds familiar! We talked about Mana as a Resource last week, so this week I thought we’d focus on Life as a Resource. Today, I’ll talk a little bit more about SWCCG, give a refresher on the principle of using life as a resource in Magic, take a broad look at the latest results from GP Copenhagen, and then dive into to Fabrizio Anteri’s 14th place Suicide Zoo list. Let’s begin! Life. Mana. Card advantage. In SWCCG, these resources were one and the same, interchangeable and pulled from the same source. From the Reserve Deck (library), cards could be added to the Force Pile (mana), which could be used to play cards from hand. Spent “mana” would be recycled back through the deck to be used again. A player’s “life total” was equal to the cards in his Reserve Deck, and cards could be drawn into hand from the Force Pile (instead of spending mana, you could draw a card into your hand). In SWCCG, cards in the library represented both total life points and potential mana. Available mana could either be used as such, or drawn for card advantage, thus decreasing both “life” and potential “mana” sources. In my mind, the brilliance of SWCCG was the fact that three separate resources (life, mana, card advantage) could all be self-contained in the Reserve Deck, one continuously cycling system. I say all this to introduce you poor souls to SWCCG, also known as Heaven-In-Cardboard-Form. Also, to explain my preoccupation towards what some refer to as “linear strategies”, but I call “optimized decks”, decks that take a particular concept or technique and execute that concept or technique to the best of its potential. Linear decks, in my mind, are relatively simple. They can be focused on attacking, with small to medium-sized creatures, and maybe with access to a small number of interactive spells for furthering its goals. Abzan Aggro in current Standard comes to mind, along with Mono-Red. But while these strategies are definitely “linear”, I wouldn’t consider them “optimized“. Optimized strategies are pushed to the limit, where almost every non-land card (and sometimes even lands) work towards the execution of a single goal. This is seen most often in combo decks like Living End and Storm, where every piece of the deck fits together perfectly. It can also exist in aggro decks, where cards work to generate an advantage and execute the deck’s gameplan. Let’s take a step back to Magic Fundamentals Day One. We have a Snapcaster Mage in play and a healthy 14 life. Our opponent is at 7 with a Gurmag Angler. We have a Lightning Bolt and lands in hand, while our opponent has a Kolaghan’s Command we know of and some other cards. It’s unlikely we are going to be able to fight our opponent with the limited resources we have available (read: cards that do things). Our opponent tanks for a minute, then attacks us with Angler, giving us two options. Option one: we block, finish off the Angler with a Bolt in hand, and hope to draw a Terminate for Angler 2.0 once our opponent recurs him with Kolaghan’s Command. Option two: we take the hit, looking to crack back for two and put our opponent to a virtual 2 with the Bolt we have in hand. Our opponent attacked into our Snapcaster when he could have killed it, which suggests he wants to save his Kolaghan’s Command in case we kill his Angler. At this point, every Lightning Bolt, Snapcaster Mage, and Kolaghan’s Command left in our deck becomes an out with our opponent at two. We increased our outs from 2-3 (the Terminates left in our deck) to probably 7-9 (Snaps + Bolt + Kolaghan’s Command). How did we do this? By using our life as a resource! Life points, just like mana and card advantage, can be exchanged for gains in other areas. In this scenario, we used 5 life points to essentially tap our opponent’s creature, allowing us to swing in with our significantly weaker creature without fear of being blocked to put our opponent into burn range. In the article, Gavin explains how Delver decks effectively used Life as a Resource with cards like Gut Shot and Mental Misstep to slow opponents down while they worked to execute their gameplan. My inner red mage loved playing Delver, controlling the pace of the game, and killing my opponent while they sat with a full grip of cards they never had time to cast. Last weekend 1,345 players descended upon Copenhagen, each searching for fame and glory through Magic cards. Coming off of Grand Prix Charlotte, Collected Company Elves and Goryo’s Vengeance combo were at the forefront of everyone’s mind, with big-mana decks like Tron and Amulet Bloom slightly behind. While I did not personally play in the recent GP (my walking legs don’t reach Copenhagen), those that did and wanted to succeed would have to keep in mind the top performers from Charlotte and the SCG Season Two Invitational if they intended to place well. A full 14 different archetypes finished in the Top 16 of GP Copenhagen, with Merfolk occupying both the top spot and another Top 8 performance. Grixis also did well, placing two copies in Top 8: one with Delvers, one without. Tron and Goryo’s Vengeance both placed a copy within the Top 16, though were held out of Top 8. The best Amulet Bloom deck finished at 22nd, while Elf Company doesn’t even seem to have made Day 2. One detail of note from Copenhagen is the prevalence of big-mana hate, with almost every deck packing tech like Blood Moon, Fulminator Mage, Ghost Quarter, and Cosi’s Trickster. To me, the biggest takeaway from GP Copenhagen is that almost every deck in the format is susceptible to hate, except perhaps Twin. Twin’s many varieties placed 25 copies into Day 2, almost 16% of the metagame. Twin has been the consensus top deck of Modern for a while now and consistently puts up numbers despite having a target on its head. Decks like this are what I love the most about Magic. Every card works to accomplish a specific objective, and the strategy as a whole pushes one of the fundamental principles of Magic (Life as a Resource) to its fullest, riding the literal edge of what is possible. Similar to the Delver decks of New Phyrexia Standard, Suicide Zoo takes advantage of free spells and uses its life total as a resource to generate an advantage and pull ahead of the opponent, keeping them on the back foot and off of their primary gameplan. Fabrizio received a well-earned deck tech for his efforts at Copenhagen and I want to talk about Anteri’s innovations to the list and some finer points of the deck. The main changes include swapping Steppe Lynx for Kird Ape, moving Thoughtseize to the main, and abandoning Nourishing Shoal for Leyline of Sanctity. One final thing before we jump in: I won’t give a full primer on the deck again, so for anyone unfamiliar with the deck or how it operates, I highly suggest reading my primer for a brushup. Kird Ape for Steppe Lynx – Steppe Lynx is a powerful beater, but only on turn one. We only play 16 lands, and while sometimes we cantrip into additional lands and flood out, other times we only see one or two lands all game. This often leaves Lynx as a 0/1 past the third turn. Also, while the goal of our deck is to actively cause pain primarily through our manabase, supporting four different color one drops (Death’s Shadow, Wild Nacatl, Monastery Swiftspear, Steppe Lynx) is difficult, especially with one-land hands. Dropping Lynx means we only need white in the maindeck to pump Wild Nacatl, and playing Kird Ape makes Stomping Ground the “best” turn one land for most hands. Thoughtseize over Lightning Bolt – Lightning Bolt is synergistic with the deck in the sense it is cheap and causes damage, but it often doesn’t do enough to warrant its slot. In our deck, Bolt is at its best when going to the face and pumping a Monastery Swiftspear, but even then Mutagenic Growth does almost the same thing for “free”. At its worst, we have to use Bolt to remove creatures, which we normally don’t care about as our creatures are usually bigger than x/3. The creatures we really care about killing (Deceiver Exarch, Gurmag Angler, huge Tarmogoys) are out of Bolt range, which makes Bolt inefficient and inconsistent removal in our deck. Think about that for a second: Lightning Bolt is inefficient and inconsistent in our deck. Thoughtseize, on the other hand, does exactly what we want. It removes Tarmogoyf and Terminate. It functions as removal and protection. It even Shocks us for two! Cheap, flexible, fuels delve and taxes our life total, Thoughtseize is quietly one of the best cards in our deck. Leyline of Sanctity over Nourishing Shoal – Nourishing Shoal did good things for us when we played it. Alongside Become Immense and Hooting Mandrills, Shoal was a “free” six life against strategies like Affinity and Burn. The issue here is that two cards and six life wasn’t enough; Burn really is that horrible of a matchup. Leyline of Sanctity is an all-star against them in our deck, more so than other decks, because by the time they can find and remove it with Destructive Revelry, we are usually too far ahead. Just disrupting them for a turn or two is all we really need to develop a board and start hitting hard. Leyline also helps in the Jund matchup, which can sometimes be a breeze but can also be quite difficult for us. If they draw the Dark Confidant/value half of their deck, we run them over, but if they go discard into removal into Liliana we can’t even compete. Leyline is a solid card that can invalidate their best draws and leave them dead in the water when we attack their hand with Thoughtseizes of our own. Vines of Vastwood – Vines works as an Apostle’s Blessing that also pumps. With Vines of Vastwood, we should usually be sequencing our lands as such – Stomping Ground/Overgrown Tomb/Temple Garden if we have three fetches – Stomping Ground/Godless Shrine if we two. 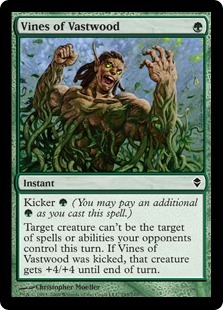 The great thing about Vines is that we can usually get the pump from it as well, as most opponents will wait to use removal on our turn in an attempt to snag creatures after we Immense/Rage. Similar to how Infect opponents should be removing creatures during their own main phase, our opponents are punished by waiting for our combat to use removal by Vines and Thoughtseize. Suicide Zoo is a powerful strategy that does something unique. While most decks are looking to goldfish, and some are messing around with Kolaghan’s Command, we just get to bash face and power out huge threats. Some view Suicide Zoo as a glass cannon. It really isn’t. Infect suffers from weak creatures, a low creature count, and dies to things like Izzet Staticaster and Night of Soul’s Betrayal. Affinity can’t fight through hate if people decide to prepare for it. If we want, we don’t even need to assemble our two piece combo, as we can just aggro with Wild Nacatl and Death’s Shadow the normal way. Suicide Zoo even benefits from the fact that both halves of our “combo” are perfectly serviceable on their own, which can’t be said about Deceiver Exarch and Splinter Twin. People piece together information to fit whatever narrative already exists in their head. If someone plays a deck like Splinter Twin, Jund, Affinity or Amulet Bloom and go 0-3, people will generally assume they got particularly unlucky, because that’s an explanation that fits what they already believe. But if someone plays an unusual or unknown deck and has the exact same result, the focus will generally instead be on the quality of the deck rather than on the player’s misfortune – again, because it fits their narrative most effectively. I think in many cases, players make decisions about what decks to play based on these factors. They feel like as long as they play a known – and thus “safe” – deck, their choice can’t really be called into question. If they have a poor finish playing Splinter Twin, at least they don’t have to worry about it being because they picked the wrong deck. But if they do poorly with a deck of their own design, or something similarly off the radar, they may feel foolish for making that decision in the first place. No one has ever built a good deck without building a bad deck first, and many of the best decks have sprung from ideas that others thought were foolish. This narrative can also be flipped. Often, a gimmick deck or new strategy pops up to widespread derision and dismissal, and a few brave souls pick it up and start working on it. Then it eventually wins a Pro Tour and becomes so oppressive it must be banned. This is not to say I believe that Suicide Zoo is “best-deck capable” (which it very well could be: I just don’t know). I am saying that dismissing a deck because it isn’t “proven” or “Tier 1” only restricts our thinking and hinders us as competitive players. When viewers to my stream ask me “Why are we playing this deck”, partly as friendly trolling but also because they think the deck is “bad”, I usually respond “To learn.” Which is why I read, write, and play Magic in the first place. What do you think? Does Suicide Zoo have what it takes to put up consistent results in Modern? If not, why not? What do you think about my thoughts on using Life as a Resource? Do you remember SWCCG? Let me know in the comments below! For next week, I plan to do a video on either Grixis Control or Suicide Zoo where I give a Deck Tech and run it through a Magic Online Daily event. Which deck would you rather see me play? Let me know in the comments! I’d personally like to see a daily event played with SWCCG’s Toys and mains. Let’s fire up the old Holotable and get to work then! Much ineresting article. Thank you. Suicide zoo for the daily + deck tech. It’ll be interesting to see if its a deck that can perform under conditions where people are more aware of its existence. More often than not, a decks initial performance comes more from a surprise factor in regards to people not understanding the best way to defend against it. Count me in as interested for a Daily and a Deck Tech if at all possible. I’d like to see if this was a flash in the pan or not, and that would go a long way toward deciding it one way or the other. Keep an eye out for a video around next week then! You make a very good point regarding initial performance possibly tied to “surprise factor”, that will be one of the main talking points during the video. I grew up on the SWCCG! Absolutely loved the game, had complete sets of Hoth and Dagobah, all the main characters, etc. Speaking of brews… guys, we have to break Demonic Pact. There are plenty of brewers here. Make it work. I would definitely be interested in a Suicide Zoo video. Great article today, thanks so much! Also, awesome info about brews! Well written optimized article trevor! keep up keeping up! Suicide Zoo!! !’ Thinking about converting my zoo deck to it(only missing baubles and shadow) and that deck seems awesome and fun! Go for it! The deck is a lot of fun, you won’t regret it. Nice article, a plain good smooth read. Keep em coming! Good example of how to use life. For the deck, why not goblin guides over kird ape? It’s a good question, one that was easier to answer when Steppe Lynx was the one drop of choice. I submit to the idea that this strategy cares even less about giving our opponent resources than Burn, and the free information can definitely help us influence “combo” decisions and when to go all in with pump spells. Thanks for the insight. And quick response. It’s my understanding that it’s a list from an older season: Trevor just put it there to illustrate the concept of “life as a resource”.